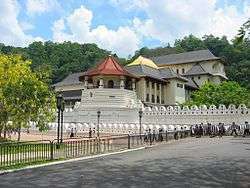 The Sacred Relic of the tooth of Buddha (Pali danta dhātuya) is venerated in Sri Lanka as a cetiya "relic" of Gautama Buddha, the founder of Buddhism. According to Sri Lankan legends, when the Buddha died in 543 BCE, his body was cremated in a sandalwood pyre at Kushinagar and his left canine tooth was retrieved from the funeral pyre by his disciple, Khema. Khema then gave it to King Brahmadatte for veneration. It became a royal possession in Brahmadatte's country and was kept in the city of Dantapuri (modern Puri, Odisha). 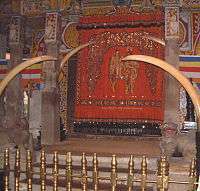 Aside from the relic in Sri Lanka, several relics in other countries are also reputed to have a tooth-relic of the Buddha. 1 2 "The Buddha's Tooth". About.com. Retrieved May 12, 2013. 1 2 "Top 10 Religious Relics". Time. April 19, 2010. Retrieved May 12, 2013. ↑ Dhammakitti (1874). 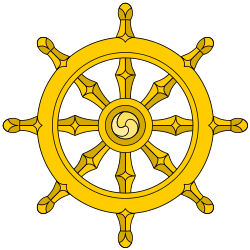 The Daṭhávansa; or, The history of the tooth-relic of Gotama Buddha [by Dhammakitti]. Tr., with notes, by Mutu Coomára Swámy. ↑ "The Eight Great Temples in the Western Hills (Badachu)". china.org.cn. Retrieved May 12, 2013. ↑ "History: Fo Guang Year 32". Fo Guang Shan Monastery. Retrieved May 12, 2013. ↑ "Temple Name: Engaku-ji". Rinzai-Obaku Zen. Retrieved May 12, 2013. ↑ "The History of the Buddha Tooth Relic Temple & Museum". Buddha Tooth Relic Temple. Retrieved May 12, 2013. ↑ "No April Fools': Followers Claim Rare Buddha's Tooth With Healing Powers Continues to Grow". NBC. Retrieved May 12, 2013. ↑ "The 10,000 Relics Collection". Bodhi Light International. Retrieved May 12, 2013.